Big shoots, 50-60cm tall - Vigorous species, widely distributed in Central-Southern Africa. 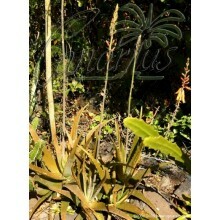 It has larger tall flat leaves, marked with pale green spots and a red margin. It likes shade and grows indoors. Traded in Africa as a medicinal plant. Sansevieria hyacinthoides looks like a larger Sansevieria trifasciata, having wider and taller flat leaves, deep green in colour, marked with pale green spots and a typical , thin, reddish, dry margin. This is a most vigorous species, widely distributed in the central and southern regions of Africa , on rocky outcrops and in woodlands. This was the earliest species of Sansevieria to be grown in Europe, described and illustrated by J.Commelijn in 1703. 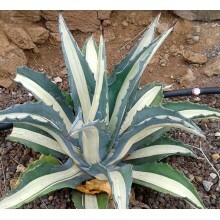 Sansevieria hyacinthoides is tropical species which likes full shade. 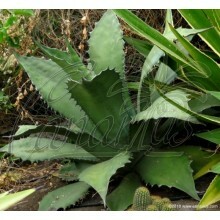 It grows well indoors as a house plant and it is neglect-tolerant because it can spend weeks or months without water! 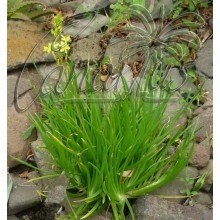 Plant in well drained garden soil mixed with plenty of compost and mulch. Water little and regularly until established, after which water need only be supplemented when soil gets dry. It is used as an ornamental plant, both indoors for home decoration and outdoors, in a shady mediterranean or tropical garden. The rhizomes and leaves of this Sanseveria are traded in Africa as a medicinal plant, used for earache, stomach ache, toothache, ulcers, haemorrhoids, diarrhoea and internal parasites. Just browse the internet and read more. Be careful, not all useful plants are edible, some are toxic if eaten or applied to the skin. Strong ropes is made from the fibres in the leaves. We offer big shoots with rhizomes, 50-60cm tall, often sent bare root. These plants are very tolerant of bare-rooting.